What a lovely, secluded setting awaits the fortunate guests selecting Dogwood Point for their getaway spot. A pretty drive along a Brown County ridge top will deliver you to a rustic log cabin, surrounded by native hardwoods and lots of blue sky. Upon entering through the front door, a large living room welcomes you with comfy furniture gathered around the stone fireplace with gas logs. Large screen satellite HDTV and WiFi will make couch potatoes and computer geeks contented. Of course, one could always choose to read a book, take a nap, or, if you’re lucky enough to get some rain, go out on the wrap-around porch and listen to the raindrops pelting the cabin’s metal roof. Now, that’s some serious country fun! There’s a roomy kitchen and dining room adjacent to the living room with a table big enough for a couple or a crowd (if you’ve been generous enough to include a few of your nearest and dearest in your travel plans). French doors at the end of the dining room open on to a small back porch that leads to a new deck with a large spacious hot tub and a firepit just off the deck. Up the stairs to the second floor is where you’ll trundle off to bed at day’s end. The master bedroom features a large space with a king-size bed ; and then there’s a queen-size bed in the second bedroom. Each bedroom has a built-in window seat that’s nice for reading or watching the moon come up over the tree tops. The bedrooms share a full bath on the second floor; but there’s a handy half-bath on the main floor, as well. 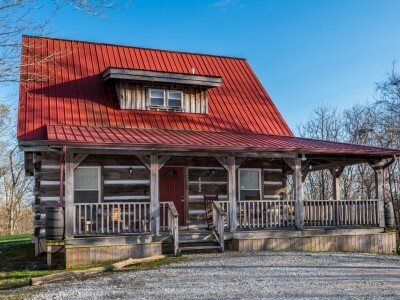 Dogwood Point is nicely situated between Nashville and Bean Blossom so you’ll be within just a few scenic minutes of activities in either location. Think: Bill Monroe Bluegrass Festival, Remember Me Antiques, Greg Schatz Pottery Studio, and the Flower & Herb Barn just to name a few all to the north in the Bean Blossom area. Then to the south in Nashville, you might want to visit Hob Nob Corner Restaurant, Brown County Playhouse Theater, Brown County Winery, or spend several hours browsing the many shops and galleries in town. Whatever your preference for spending your down-time; Dogwood Point and Brown County are sure to please. Call or go online today to make your reservations!